What are the qualities of a great forklifts dealer? At Access Mechanical Handling, forklifts are our business. Forklifts are what we do best. If you are considering changing your fleet of forklift trucks or even thinking of hiring a forklift truck for the first time, we have compiled this checklist of important points to help you make the best choice for safety and reliability. CAN THE FORKLIFT TRUCK DEALER YOU ARE CONSIDERING OFFER YOU A FAST, RELIABLE AND LOCAL SERVICE? Does the forklift/forktruck company operate within a reasonable distance from your operations? In order to maximise the usage of your forklifts it’s important that the company you are dealing with understands your local requirements and can get to you fast. The faster they can get an expert engineer out to you, the faster any forklifts servicing or repairs can be done and the faster you get your work-load completed. Access Mechanical Handling for instance covers Edinburgh and Glasgow from our office and service depot in Bellshill. This allows easy striking distance to Edinburgh within 25 minutes and Glasgow 18 minutes. With the introduction of the new M74 link this also allows easy access to South Glasgow and through to western areas, such as Greenock and Ayrshire. As well as Glasgow and Edinburgh, Access Mechanical Handling can quickly get engineers out to Stirling, Falkirk and all of Central Scotland. DOES THE COMPANY YOU ARE CONSIDERING ENTRUSTING WITH YOUR FORKLIFT FLEET HAVE A STRONG AND RELIABLE REPUTATION? How long have they been in business? How do they back up their reputation? What systems do they have in place for problem solving and maintenance checking? Are they approved by an independent, renowned standards organisation? Access Mechanical Handling has been a market leader in Scotland’s forklifts industry since 1986. When you entrust Access Mechanical Handling with your forklift requirements you will have peace of mind. You will rest assured that you are collaborating with a company boasting a proud record of 26 years selling and servicing forklifts to all kinds of industries throughout Scotland. We can back this up through our accreditations and certifications, such as our continued membership of The Fork Lift Truck Association and our long-standing ISO Standards Certification, as well as our ability to carry out Thorough Examinations. WHAT AFTER SALES SERVICE DOES THE COMPANY OFFER TO KEEP YOUR FLEET OF FORKLIFTS WORKING AT OPTIMUM CAPACITY? At Access Mechanical Handling we believe in developing a long term, reliable, fast and friendly forklifts service for all our customers, large or small. We don’t use 0800 or any premium call services. We will happily work with you to ‘bed in’ your new forklifts and provide you with tips to get maximum efficiency from your new or used forklift truck. All your calls go direct to our personally staffed Bellshill depot. If you have a forklifts service contract with Access Mechanical Handling you will never deal with an automated phone service. Outside of office hours all service calls are directed straight to our service engineers, so that you can have a speedy response to any engineering issues 24 hours a day, 365 days a year, always with the human touch. IS THE COMPANY YOU ARE CONSIDERING QUALIFIED TO CARRY OUT A ‘THOROUGH EXAMINATION‘ OF YOUR FORKLIFT TRUCKS? A ‘Thorough Examination’ is a legal requirement for all forklifts. 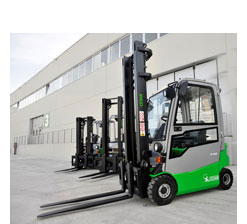 It is an extensive examination of the forklift truck which ensures, as far as humanly possible, that your forklift is in safe working condition. By law the Thorough Examination must be carried out at least once a year on every forklift truck. Not all forklift dealers are qualified to carry out these Thorough Examinations. In fact some forklift dealers cannot supply any qualified staff for Thorough Examinations but at Access Mechanical Handling we are proud to say that we have 2 Thorough Examination managers and ALL Access engineers are qualified to carry out these very important examinations. This means when choosing Access Mechanical Handling you are in safe hands. IS YOUR FORKLIFT SUPPLIER A MEMBER OF THE FORK LIFT TRUCK ASSOCIATION? The Fork Lift Truck Association has been in operation for forty years. It ensures that all it’s members adhere to a strict code of practice and fair and equitable treatment of all it’s customers. As members of the FLTA we at Access Mechanical Handling have great access to the most up to date Health and Safety information. We believe that these elements prove our professionalism, competence and integrity which combine to enable us to provide better service, trust and peace of mind for our customers. If you’d like to talk with a forklifts expert from Access Mechanical Handling simply drop us a line on our contact page or give us a call on 01698 745859. We’d love to hear from you.